A quartet from Glasgow, Sons and Daughters, comprised of ex. 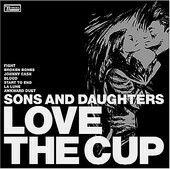 Arab Strap members Adele Bethel (guitar) and David Gow (drums), and rounded out by Scott Paterson (guitar/bass) and Ailidh Lennon (mandolin/bass), follow up their self-released EP, The Lovers EP, with Love The Cup, a homage to the late Johnny Cash. Fusing indie-rock aesthetics with blues-rock and even roots music, Love The Cup is a spiraling mixture of melodic glow and hard-driving, danceable beats, coming off something like the Blues Explosion if they were a pop band, or an indie-pop band that just loved blues music. The latter is exactly what Sons and Daughters are, though they don't adhere to the loose, bounciness of indie-pop, instead preferring the jagged rock edges of post-punk rock appreciation of indie-rockers. It's an interesting, captivating mix filled with hooks and lots of rhythm. Played inventively and intensely, Sons and Daughters deliver the goods whether they're playing more traditional blues with only little flare ("Start To End"), or going full throttle with their rock hybrid ("Johnny Cash"). I'll give this an A-.